When I first entered the field of dietetics, I was against all fast food. To me, McDonald’s was an evil corporation filled with McFatty fake fried food. And to a certain point, it is. According to their website, a single Chicken McNugget contains over 25 ingredients, some of which I can hardly pronounce. My opinion of McDonald’s changed one week after my first chemotherapy session, which lasted 8 days straight. My body literally starved for a week as my body was trying to fight off the nauseating side effects of the toxin flowing gracefully through my bloodstream. Bags upon bags of potassium and sodium in the form of clear fluids were the only things keeping me alive. The effects of chemo didn’t stop once the 8 days were over. For two weeks after, my appetite was almost nonexistent. Every food tasted like a bite of cardboard with a dash of metal. Oral supplements didn’t help, as they resembled the taste of sweetened cardboard – strawberry flavored, to be exact. I remembered learning that one of the leading causes of death during cancer treatment is malnutrition. As I saw my weight drop rapidly, I decided I needed to start eating anything to keep my body going. I thought of the most flavorful comfort foods, and for some reason opted for McDonalds. 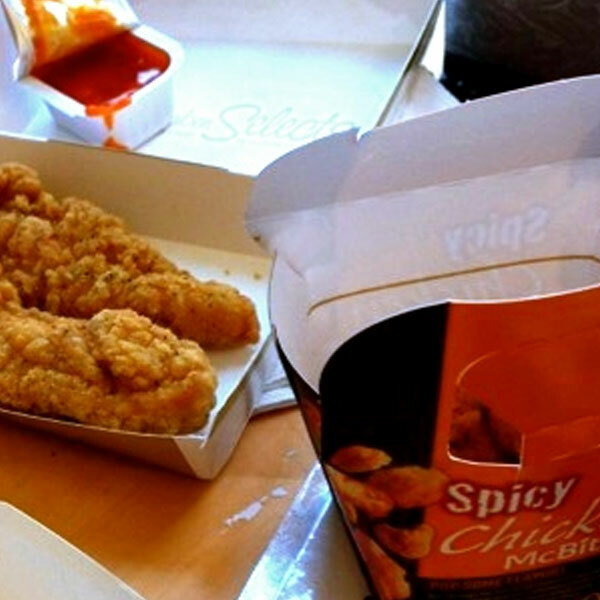 As I sat in the hospital bed dipping my first piece of chicken selects into BBQ sauce, I began to feel guilty. Conveniently, my dietitian walked by my room, saw that I was finally eating, and gave me a huge grin. She walked away, not commenting on my lunch choice. For the next 4-chemo sessions, I followed a similar pattern of non-intentionally starving myself, and then eating foods I normally would not have touched pre-cancer life. I slurped down ramen noodles and consumed cans of processed, sodium-filled soup. The more flavor, the better. As a result, my weight steadily increased back to almost normal and I had the strength to resume more chemo. I’m not saying that every cancer patient will have the urge to eat processed fast food. I bow down to any patient who can physically and mentally devour leafy vegetables and whole grains during treatment. But for me, McDonald’s actually saved my life. I have never been against specific diets such as vegetarianism or veganism. I strongly believe that people are entitled to their own beliefs, as long as they aren’t doing anything blatantly questionable, such as eating nothing but cabbage soup and bananas in hopes of losing 10 pounds in a week. As someone who has studied nutrition for 5 years, I often hear and see people trying to follow “the perfect diet”. Obsessing over what types of food to eat is ingrained in our culture. Whether it may be trying to shed a few pounds or trying to avoid diseases such as diabetes and cancer, our society tends to jump on the newest “super food” and goes absolutely crazy over it. What’s worse is when people judge others for not believing in the same diet or health benefits of foods as they do. The lesson is: there is no perfect diet. Unlike the biochemical processes that function essentially the same in every average human body to keep us alive, humans also possess unique mental, social and even environmental needs – all of which also help keep us alive. You cannot go wrong with a diet filled with vegetables and fruits, but if you sometimes crave a chicken nugget or two, don’t beat yourself up over it.